Switzerland's picturesque village of Engelberg (the name means: "Mountain of Angels" in German) is a great place for a big family with children to visit. 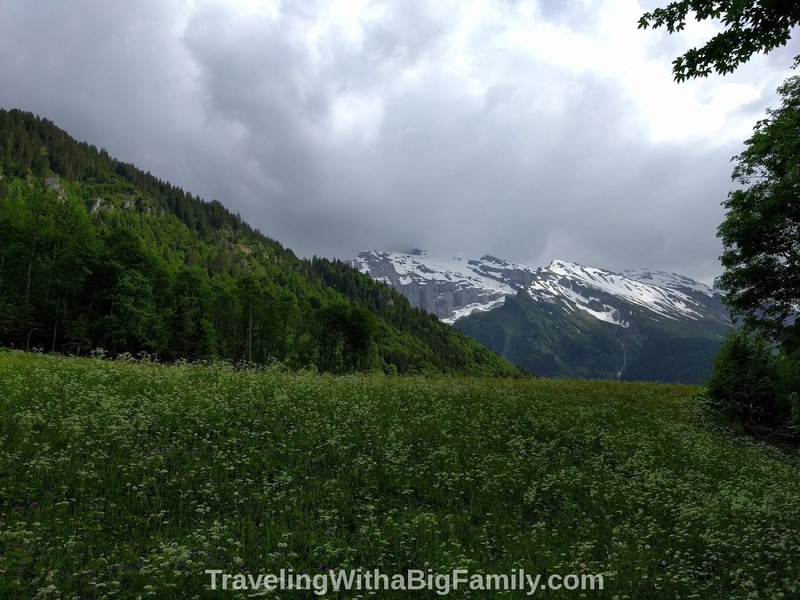 It is a ski resort village, with lots of non-Swiss residents and visitors on vacation, but it is also a welcoming place for non-skiers like us. 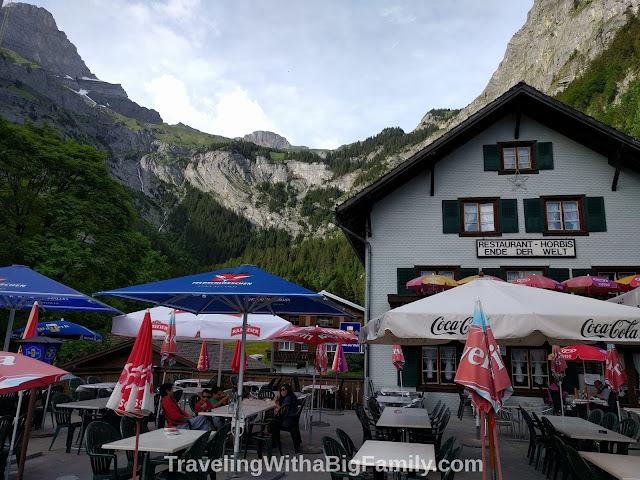 As it is a ski resort village, we found that many of the restaurants in the area were the sort of hip, trendy places that are overflowing with American and European tourists – which is neither our kind of vibe, nor our kind of budget. We really didn’t cross the Atlantic and travel all that way just to eat $25 plates of hamburgers and fries with a horde of our fellow Americans. Most of the time, we bought food at the local grocery (Co-op) and made our own meals, saving a fat chunk of cash on dining expenses every day in the process. . But since we were in Switzerland for only a few days, and leaving soon for Italy and Greece, I wanted us to experience at least one authentic Swiss meal - definitely not burgers or pizza, but Swiss food like what a Swiss family might eat. So, one activity on our agenda, time permitting, was to head away from town towards a remote, but cool-sounding restaurant I had researched before the trip. After seeing Mt. Titlis and the snow play area (for more on that, see this post), we spent some time the next day just hiking uphill behind our rented home. We had a blast, and worked up our appetites. Towards the end of that hike, we started thinking hard about where our next meal might be coming from. I knew we were leaving the next day, so I really wanted to to get out to that cool Swiss restaurant I had read about. The only problem was that it was a very long way away. And we were enjoying our hiking so much that none of us were ready to call a taxi - we wanted to at least try it on foot. We would first have to backtrack down to our rented home, then keep hiking another half an hour to reach the town. From there we figured it would be another 30 minutes' hike to reach the end of the world. However, it took us a full two hours because of a nice stop at a Benedictine monastery and cheese factory, where we topped off our tanks with apple juice and house-made yogurt - some of the best yogurt we've ever had. The path to the end of the world passes the cheese factory on the way out of town. You just follow the sidewalk along the river until you get to the Eienwäldli campground. Stop right there and look for a sign across the road, which points the way to the end of the world. We found the sign a bit confusing, as it had a helpful arrow, but we couldn't exactly tell if the arrow was directing us to continue on the road we were already using ,or to split off uphill onto a footpath. I asked a passing tourist for directions but he had never heard of the place (which I took as a good sign, actually). I had plenty of time to study the roadside sign and arrow while waiting (because traveling with kids is mostly about finding a restroom every 20 minutes, as discussed in this post). The footpath looked interesting, but kind of steep. We figured the worst that could happen is we'd have to backtrack downhill to get back to this same spot, so we took the footpath. Leaving the main road improved the hike immediately (and it was already beautiful before that). 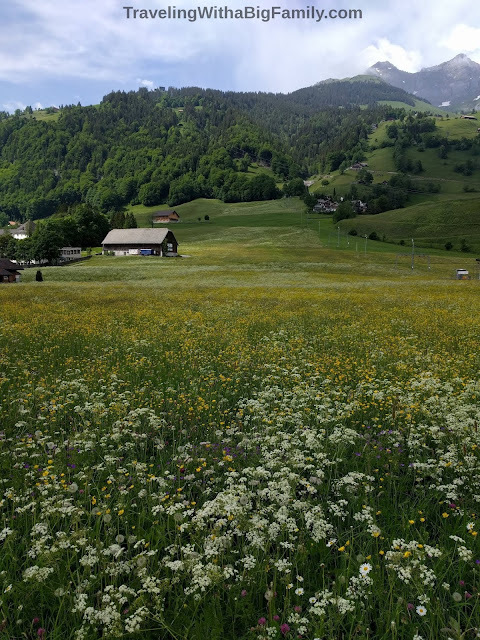 We walked through some gorgeous fields, saw an old barn, and honey bee condominium featuring a dozen beehives, with the bees actively gathering pollen from the fields full of flowers nearby. This hike would have been a great activity for a big family, even without the same destination in mind, as discussed in this post. Swiss beekeeping looks very different than in the US. 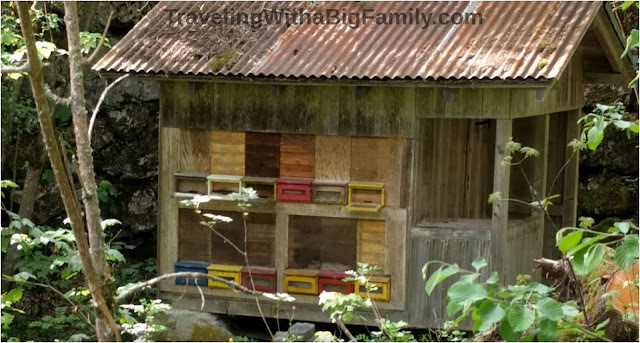 Nice variety of colors and a great way to protect the hives from the weather in the mountains. We met an elderly couple walking downhill and they assured us that the end of the world was just a little farther on - no more than 10 minutes. They had just been there, in fact, and said we'd love it. So we kept going uphill, and finally made it. We had finally arrived at the End of the World! This particular Swiss restaurant is called "Restaurant Ende Der Welt," that is, "End of the World Restaurant." It is located right where civilization ends, at the base of towering cliffs that form a U-shape around the last outposts of humanity. The restaurant is a place where the service is, well, perhaps a tad gruff (but in a Swiss way - not mean-spirited at all, just not at all the sort of subservient, fawning, tip-seeking attitude we're accustomed to seeing in certain American restaurants). We were served by the owner himself, I think. He seemed surprised that I wasn't fluent in Swiss German. He let me know right away - by speaking only German in response to my requests to speak English - that he couldn't reply to me with even a single word of English. Communication was going to be quite difficult. But, he was very patient with us. I had to use a translator on the phone, to try to read some of the menu options. The owner left us to study the menu for a few minutes. The first thing I saw was "deer meat" and I knew I wanted that. I'd never seen that on a menu anywhere in the world, and I hadn't tasted deer since I was in elementary school. My wife also wanted to try it, as did my oldest son. So the three of us ordered deer meat while the other kids ordered macaroni and cheese. Ordering the Swiss mac 'n cheese went smoothly. The owner seemed to take that request with a "Well, of course" nod. But he seemed oddly resistant to the idea that three of us would be having deer meat for dinner. It was, of course, difficult to understand the nature of the problem, since the owner only spoke to me in German. I asked him things in English and badly pronounced German. He responded exclusively in German. He repeated his objection, in German, and asked me if I was sure we wanted hirschfleisch (deer meat). I said yes, deer meat. He said it was - well, he said something in German - "trocken," I think. He helpfully pointed out the descriptive word on the menu, saying it out loud for me at least three times, and then he waited while I looked it up. The word he was pointing out to me translated as "dry." "That's perfect!" I thought. My oldest son really doesn't care for foods covered in sauce or gravies anyway, so I smiled and nodded some more, enthusiastically ordering the "trocken hirshchfleish." The owner grumbled something in German - no idea what, but it had the ominous tone of "Very well then," and stalked off to the kitchen. We could hear him and his wife discussing our order. I imagined she was posing to him the same objections he had posed to us. He said a few words and they got to work preparing the hirschfleisch. "I wonder what that was all about?" my wife wondered aloud. "It didn't seem like he wanted us to order that. But why is it on the menu then?" I said. "Well, at any rate, we've successfully ordered food, entirely in German," I said. "He doesn't speak a word of English, and I couldn't understand a word he said, but somehow we got the order placed! And maybe we don't know what we're getting into, but I can hear dishes banging in the kitchen, so we know we're getting some kind of food out of this deal." About five minutes later we were served three heavy platters featuring three heaping mounds of dried deer meat, garnished with a few pickled pearl onions and a smattering of sliced vegetables. It wasn't a "dry" meat in the sense of being free of sauces; it was "dry" to the extent that it had been smoked and dried as a means of preserving it. Each plate contained a huge portion - one plate could have easily fed the three of us. All six of us could have eaten from it and there wouldn't have been any scrape-ups over the last piece. I suspect six grown men could have eaten well from those three plates. I can scarcely describe the taste - something like a cross between smoked beef jerky and salami - with the flavor of smoke, salt, and wilderness. It was...an experience. But the next time a waiter objects strenuously to what I am ordering, I'll take the hint! I'd probably have tried a different dish, if I'd have known just how dry "trocken" really is. We enjoyed the gooey Swiss mac ‘n cheese dish (baked, with onions), a dish called Älplermagronen (Alps-style macaroni). It was served in a large pot straight from the oven, about 20 minutes after the venison had arrived. It was also big enough to feed at least three of us. Most of us had two helpings, and there was some left over. We also went through some of the most expensive water we've ever tasted. The mineral water was sold by the liter, and was CHF 10 per liter (about US $10 per liter, meaning, US $38 per gallon). We had ice cream for desert. The meal overall was definitely a splurge, but it was a memorable trip, both the getting there on foot, and the food and service. "Oh, yes. Right away, sir" -- in perfect English! Ordering food? Good luck, not a word of English is spoken or understood here! Ready to pay the bill? "Oh yes, right away, sir!" After being at the restaurant for nearly 2 hours - including some play time out back - we called an SUV taxi to take us home. Then on the way there we remembered we were out of milk, so I got the taxi driver to drop me off in town, and carry the family back up the mountain. I walked a few blocks to the grocery store and found it had closed 10 minutes before I got there! Then I walked another couple of blocks to check on something at the train station, and found it was closed also! Then I walked one additional hour uphill to get back to our rented home. 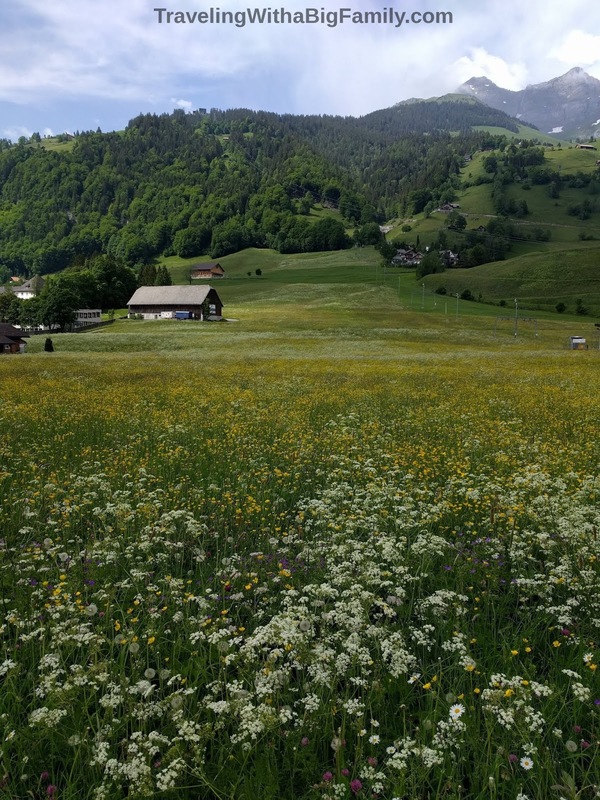 All total that day, our big family hiked 1 hour straight uphill, then hiked 1 hour downhill, walked across town to tour a cheese factory and church (about an hour for the two), then hiked another hour to an isolated restaurant, then came home by car. So, just 4 hours of walking! With all this crammed into one day, we certainly weren't following our own "One Thing Per Day" Rule on that day (for more on that, see this post). For me, this was 5 hours of walking and hiking, when you count making the futile side trip to the store and train station, and then walking back up the hill alone. I can tell you I had to take more than one break on that last leg of the hike! I'm sure a local resident could've made that last one hour journey in 20 minutes or less. I was on my last legs and my second - no, my fifth - wind. 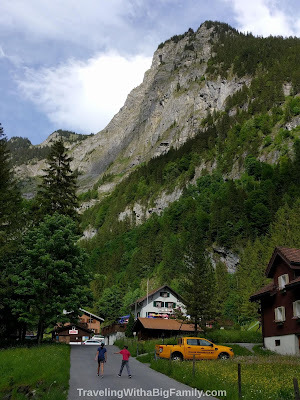 Three Americans passed me as I was catching my breath on a step, and, pausing in their English conversation about meetings and phone calls, they greeted me in German as they passed the spot were I was trying to pretend I wasn't about to die. Momentarily surprised that their greeting meant that they didn't assume I was American, I responded to them in German, and they went on down the hill. I was amused that they must have thought I was either Swiss or from some other country where I was more likely to understand the German greeting than the American "Hey." If the waiter (at any restaurant, anywhere, really) objects to what you choose to eat, take the advice! If traveling with small children to the End of the World, consider hiring a private minivan for at least half the journey - either to get there, or to return - depending on your level of fitness, and how much you've already done that day. Walking back is easiest as it would be downhill all the way. Save time for the little slide and play area out back. 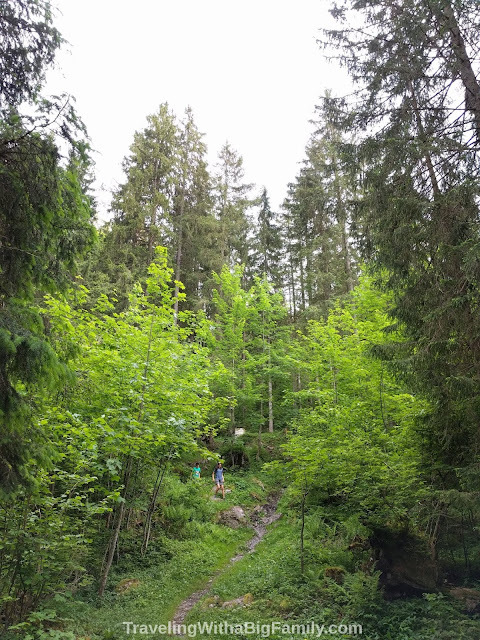 The forest immediately behind the slide is lush and beautiful, and has a marked path once you get inside. Ever ordered something for dinner that was outside of your comfort zone? Ever failed to heed the advice of the waiter about what not to order? What Swiss food do you recommend?